Kerri Barile ’94 is co-owner of Dovetail Cultural Resource Group, based in Fredericksburg. “Mary Washington has given so much to me personally – and now is providing our company with close connections to professors, students and alumni,” said Barile, who graduated from the University in 1994 with a degree in historic preservation. Since the 2005 founding of the cultural resource management firm based in Fredericksburg, Dovetail has employed more than 60 Mary Washington alumni and hosted several dozen UMW student interns. “Our business plan actually specifies that one of our priorities is to hire UMW alumni,” said Barile, who also was an adjunct professor at Mary Washington. UMW Associate Professor and Director of the Center for Historic Preservation Michael Spencer applauded the company’s many contributions. 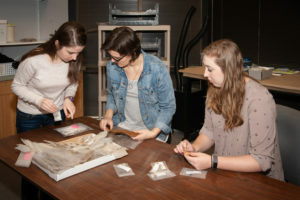 From left to right, Reagan Anderson ’17, Olivia Larson ’19 and Alison Cramer ’17 examine Civil War artifacts. Barile said she and Carmody are proud to have a part in the education of future preservationists. Dovetail currently is conducting fieldwork at the site of Fredericksburg’s future Riverfront Park. The company just completed studies on the tunnel running underneath George Street’s sidewalk, as well as Fredericksburg’s public slave auction block. Dovetail employs nearly 50 staff at both its Fredericksburg location and a satellite office in Wilmington, Delaware.